Bing has loads of interesting features besides the usual web search feature. While Bing is still finding its feet, Twitter is all over the web with tons of real time information. 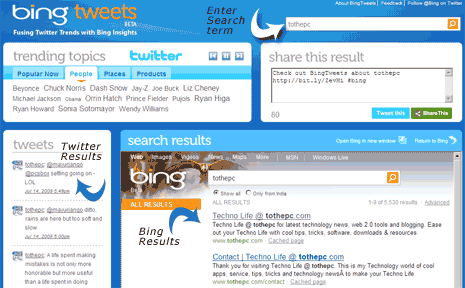 BingTweets website combines the power of instant information from Twitter with usual web based search results from Bing. Microsoft has partnered with Federated Media and Twitter for power search mashup, BingTweets. You can enter any keyword in search box located at top right and see results from Twitter and Bing in one place. While results from Bing are shown in not so comfortable looking iframe window, Twitter results have neat display. You can follow results from Twitter from different aspects like: popular now, people, places and products. If you click on any keyword on Twitter trends it display results for specific keyword from Twitter and search results from Bing. BingTweets is an interesting concept and you get to see loads of information without having to refresh or jump to any other webpage. Try search for Harry Potter & the half blook prince buzz on the internet, what say?